After years, I finally feel like I have a good brush set I can rely on forever. Like most people exposed to beauty blogging, I’ve been reliant on Sigma, Real Techniques etc for the longest time. For the last two years I’ve slowly been paying more attention to the brushes I use, investing in better ones. The brushes I’ve picked today are used almost everyday and are some of the most effective and soft brushes I’ve used by far. I’ve had all of these for more than a year now and they’ve lasted really well after many many washes. Hakuhodo B5521BkSL = G5521BkSL Highlight Brush – I placed my Hakuhodo order with mainly this brush in mind. The bristles are a mix of blue squirrel and goat hair. The tapered end is excellent for placing highlighter over a small area and for contouring. What I love best about it is that it picks up a small amount of product and deposits almost all of it. That makes it great to use on different products at a time. You’ll see me contouring and highlighting my Charlotte Tilbury Bronze and Glow at the same time with this and I won’t end up with highlighter on the rest of my face! Chikuhodo Z-4 Cheek/Highlight Brush – This was was splurge for me but now I don’t find myself dreaming about the Suqqu Cheek Brush anymore! 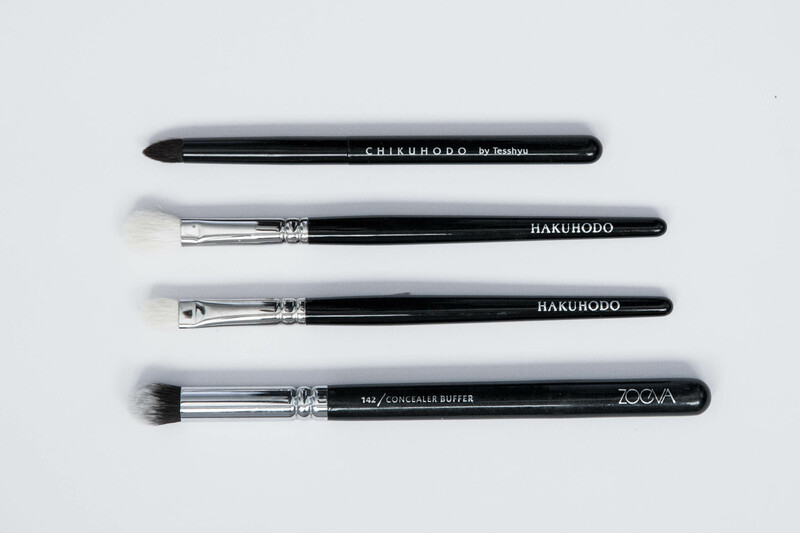 If it’s even possible, Chikuhodo brushes are slightly softer than Hakuhodo! Z-4 is my go to blush brush! It’s small and the perfect size to sweep it across. I prefer building up the pigmentation of a blush or sometimes going very subtle. It picks up just the right amount of product and again, deposits almost all of it. Sigma Flat Top Synthetic Kabuki F80 – I’ve had this for atleast four years now and it’s still as good as new. F80 is brilliant at buffing out foundation. I mainly use sheer to medium coverage foundations which take very little time in terms of blending. The more fluid it is, (think Mac Face & Body) the easier it is to blend out with this. Thicker consistencies like say, Nars Sheer Glow require a bit more time but I get a seamless even finish with this as well. I do at times use my BeautyBlender with the heavier foundations but to be honest, using this brush is just quicker! The shape has stayed in place really well over all these years and there’s been zero shedding. 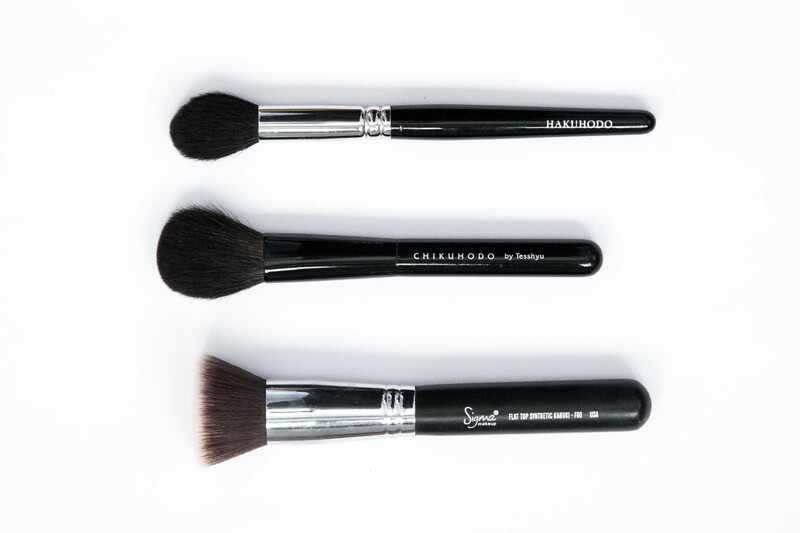 Chikuhodo Z-10 Eyeshadow Brush – Made from the hair of gray squirrel, Z-10 is also very soft and perfect for smoking out smaller areas like lower lash line or the inner corner. I love the point, it’s great at extending the liner or blending more precisely. Chikuhodo brushes just look so sleek though! They’re my favourite now! Hakuhodo J5523 Eye Shadow Brush Round & Flat – It’s the blending brush that makes it’s doppleganger, Mac 217 feel cheap and scratchy! Maybe it’s just the 217 that I bought, but it’s not very soft and I just don’t get the hype. J5523 has the same shape but it’s very fluffy and soft to touch. It blends eyeshadows so well and it’s very gentle on the eye. Hakuhodo J242G Eye Shadow Brush Round & Flat – This flat brush is made from a mix of goat and synthetic fiber, which makes it great for powder and cream products too. It picks up a ton of product and deposits almost all of it evenly. It’s a given that it’s amazing with all kinds of powder eyeshadows but it’s equally good with cream eyeshadows. I find this equally good to use with a creamier consistency like Tom Ford Cream Eyeshadows or a more stiff one like Chanel Illusion D’ombre. I had no such luck with the other synthetic flat brushes though. I really want to buy more of these! Zoeva 142 Concealer Buffer Brush – I find the traditional flat synthetic concealer brushes so hard to use! The application is always so streaky! I finally realized that I needed a denser brush and I was so happy to find this! It’s small and the perfect size to get into the corners and undereye area. I love applying my Bobbi Brown Corrector with this, blending it by tapping it across. It’s also great at blending and buffing more liquid concealers like the Mac Select Moisture Cover or the Urban Decay Naked Skin. Again, I need to buy more of these because it’s my most used brush! It’s still very soft after all this time and has kept it’s shape really well. The only brush I feel I’m missing is a good powder brush. Currently I use the Rae Morris Deluxe Kakuki brush which is small tapered and just the right size to powder under my eyes and T-zone but unfortunately, it’s not as soft as advertised. Overall, I would really recommend Zoeva for affordable brushes. I rate them higher than Real Techniques and if you’re starting out, buying one of their sets is a good investment. I particularly like them more for cream/liquid products, they’re some of the softest synthetic ones. If you’re comfortable spending $20-30 on brushes, I would highly recommend Hakuhodo for eye and cheek brushes, mainly for powder products. The prices are very similar to Mac (in some cases cheaper) and the quality is far better! My only gripe here is the availability. Unless you’re in Japan or LA, Hakuhodo can only be bought from their website. Don’t be fooled by their 90’s layout, the customer service and shipping is great! On a quick note, I like washing my brushes with Beauty Blender’s solid cleanser! 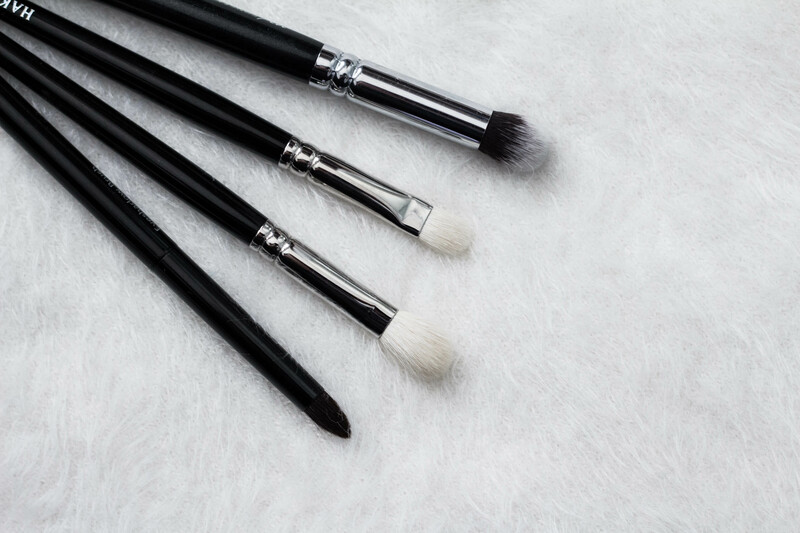 It keeps the brushes so soft and in total, it requires a lot less time and water. 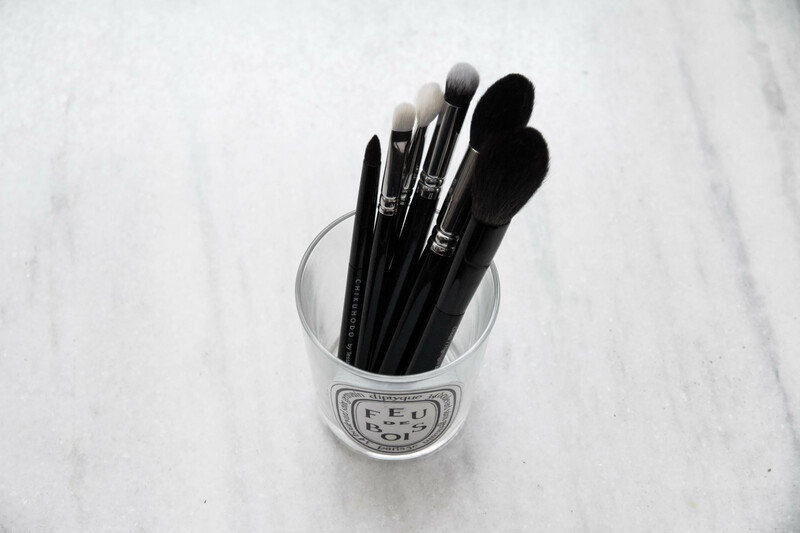 How do you keep your brushes clean? Also let me know about your most used brushes!